Looking for a fun, friendly environment to motivate and challenge you? 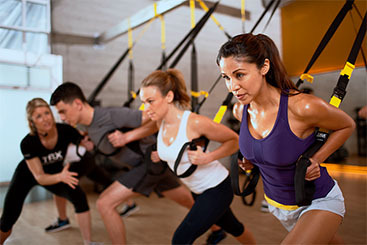 Our group TRX fitness class has it all! Whether you’re looking to build muscle, tighten your tone, or increase strength and flexibility, you are in control of how much you want to challenge yourself by simply adjusting your body position. This class is geared for all levels of experience! Class Schedule: Monday & Wednesday at 6 p.m.; Saturdays at 8 a.m.
Get that booty in shape with our Booty Maker Class! BootyMaker is a 1-hour long group fitness class targeting specifically the glutes through numerous ways (circuits, isolation, different angles, plyometrics, etc). It will strengthen the hip area, not just for looks or strength, but for mobility, range of motion and will help prevent future potential injuries or discomfort as we age! Whether you are trying to build, tone, or sculpt your booty…this class is a MUST for you! Class Schedule: Tuesday & Thursday at 6:15 p.m.
Feel the bootcamp burn! If you’re looking for an extra push when it comes to making your fitness goals a reality, then this is the class for you. 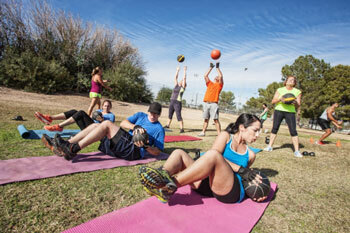 Every Saturday morning, you can experience motivating group fitness class that has waists shrinking and energy growing. It’s time to try something that will get you the results you need. Class Schedule: Saturdays at 9:30 a.m.